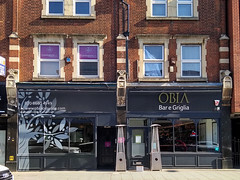 Obia was an Italian restaurant in Croydon's restaurant quarter. It has now closed. In September 2018 a notice appeared on its Facebook page stating that it was closed for refurbishment. However, as of February 2019 it remains closed, with the name removed from the frontage and the windows papered over. Italian restaurant in Croydon's restaurant quarter. It's split into two parts; entry is into a bar area with high tables and stools, and then there's a restaurant area which can seat around 40 people photo. bob visited for a lateish lunch on a Saturday in July 2018. I was the only customer when I arrived around 1:30pm, and this remained the case throughout my visit. I had the falafel burger (£7 including french fries) photo with added bacon (£1). The bacon was good quality. The falafel burger was interesting. It was crispy on the outside with a soft filling which had whole chickpeas in. The burger lost cohesion while I was eating it. The french fries were OK photo. I also had a side order of onion rings (£3.50) photo which were made from real rings of onion, lightly battered and slightly spiced. I finished with a selection of sorbets (£4.50) photo. The mango sorbet was obviously made from mangoes. A 10% service charge was added to the bill. Accessibility: Accessible toilet on the same level as the restaurant (as is the gents'). Last visited by bob, July 2018. Last edited 2019-02-07 15:21:15 (version 4; diff). List all versions. Page last edited 2019-02-07 15:21:15 (version 4).